The Garden House is one of 3 luxury cottages at Lilycombe Farm. It sleeps up to 8 people in comfort and has its own private walled garden. Lilycombe has a 15 metre indoor heated pool for rainy days. There are lovely country pub walks and lots to do, including outings to Bath, Longleat, Cheddar Caves and Wells. Jack's Barn accommodates 10 people and Deerleap has space for 4 people. This is the third time we have stayed at the Garden House and it never fails to disappoint - from the minute you walk into the open plan lounge, kitchen and diner to be faced with a lovely welcome hamper and pastries it really is a super touch after a long journey. For us it’s the amazing pool house that brings us back. Even now there are two more properties on the site (making a total of three) you are able to book your own exclusive use of the heated indoor pool house with cinema and music system. The owners are normally around and always come to welcome you and show you how to use the pool and gadgets around the house. The area is wonderful too you are within short distance of Wells and Cheddar with plenty to do for the family. We went on a pony trek with Tynings Trekking School - highly recommended. The only improvement I would suggest is better and faster broadband internet speed please. Unfortunately I had to spend some of the holiday working and the slow speed and bad reception made this a little tricky at times. Otherwise another fantastic time and we will be back! Overall a luxurious place to bring a family with young children. We had a great week at The Garden House. Very comfortable accommodation and very clean. Everything was there that we needed. The swimming pool is fantastic. Excellent service and surroundings as ever. Wonderful wonderful place. We always love coming down to Lilycombe Farm. The pool is lovely and the conditions perfect. A comfortable house situated deep amongst the Somerset lanes with walks from the door and good pubs a short drive (or local taxi ride) away. The swimming pool is gorgeous and very well maintained, with a superb sound and video system so you can swim along to a pounding beat. Lovely open fire in the house with a supply of logs from the woodland on site where you can roam and spot deer. A very relaxing place for a holiday. The Garden House makes for the perfect holiday- with enough to do on site you hardly need to leave. The accommodation is beautifully appointed with extremely comfortable beds and every comfort. Lovely to be able to have a real fire in colder months. The pool was exceptional. Jane and Richard are wonderful hosts, who went to every effort to make sure we had a comfortable stay. We arranged a weekend in the country for 8 friends to celebrate a birthday and had a wonderful time together in perfect surroundings. The owners Richard and Jane were incredibly helpful and made us feel very welcome. The countryside around The Garden House was perfect for walks and cycling and the nearby Litton pub was also great for a cosy extended lunch. Both the decor throughout and the bed linen were of very high quality. Logs for the open fire were readily available (and included in the price) and the house was very warm with its independent central and underfloor heating systems. We had a very enjoyable and relaxing weekend. Thank you Richard and Jane! Thank you so much for such a lovely stay for my wife's 30th birthday. The house was incredible and the pool was simply spectacular! We could not have asked for anything else! Richard and Jane were so helpful and we will definitely be returning! Quibbles out of the way first: a hook or two on the back of the master bedroom door and the bathroom door would have been really useful for hanging up towels etc. (Maybe guests should be warned about lots of flies and wasps - and occasional hornet - which didn't bother us at all but might be problematic for some). The beds were wonderfully comfortable, the showers efficient, and the kitchen had everything we needed. We all loved our stay, and of course the swimming pool and it's facilities are the crowning glory. We would certainly return another year if we can. I particularly liked how friendly, approachable, and helpful, the owners are, and small touches like the birthday card for my husband and the basket of welcome goodies made all the difference. We had a wonderful week in this lovely house with grandparents and grown up children. All good, especially beds and bedding. Kitchen quite tight but well equipped. Pool a real bonus. Only item missing was an ice tray for the freezer. Perfect for what we needed with 6 adults and two small children, the latter being at one end with their parents downstairs! 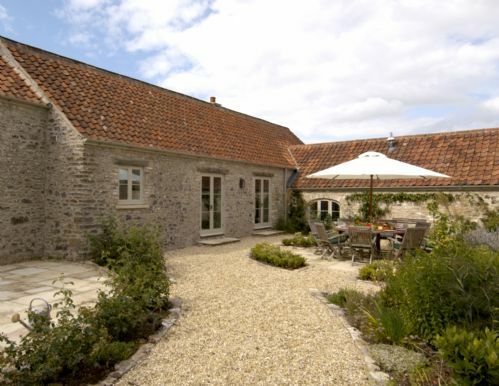 The farm is gloriously situated in beautiful Mendip countryside with Wells about 10 minutes away and Bath just over half an hour but always allow for traffic problems. The directions to the property are somewhat daunting at first and must be closely followed and don't take the side roads too fast! The Garden House has been wonderfully converted and is very well appointed and comfortable, though the kitchen area is small. The walled garden area is lovely though weather conditions did not make for sitting out! The swimming pool complex is fantastic and a real hit with the children, as was the nearby cowshed with the 3 cows! Plenty to do locally and everyone enjoyed a day at Longleat and visiting Glastonbury and Frome as well as National Trust properties. Barrington Court near Taunton is delightful. The owners are always there if you need them and most helpful, but not intrusive in any way. Wonderfully equipped house in a delightful location with a stunning pool house for residents exclusive use. Owners very friendly and helpful but also leave you with your privacy. Spacious and well furnished the house gives a large group or family plenty of room and space. But the pool house and facilities are the real jewel in the crown - one of the best indoor heated pools we have come across and for that reason we will definitely return. Thank you so much! The weekend was very good and we all thoroughly enjoyed . The private indoor pool facilities were amazing , the best I have seen in the UK and abroad . The owners made us feel very welcome and even set up an Easter egg hunt for our children. Highly recommended. Booking something online with only pictures and reviews to go on is a risk. The reward this location offers is definitely worth it. A remote farm but only 10 minutes from any food shopping you might want, it is well decorated inside and will have everything you need for your stay, comfortably sleeping 8 and a nice open plan living area so you can spend your time together. Finally, if the property wasn't enough, with Richard & Jane you have two people who seem willing to do anything to make sure you have a great stay. Trust me, you can't go wrong with this place. Have now stayed here 3 times so that probably speaks for itself. Very attractive and comfortable house in peaceful rural location but easy distance to places of interest. The swimming pool is delightful - and warm and clean. The owners are lovely- helpful and responsive but not over present. tremendous house, lovely grounds, brilliant location and the swimming pool facility is a real wow factor! I booked The Garden House for a week in November as a holiday to celebrate a number of family birthdays. We took our children (13 month old twins), my parents and my sister and her husband. I can honestly say the holiday and the property suited everyone and we were never at a loss for something to do. The children had heaps of space to run around, theres a golf course not too far for my golf-mad brother in law and of course Bath is really close so we had some wonderful days out at the Christmas markets. The property is so well laid out and has some amazing original features. It’s wonderfully peaceful and has a gorgeous private courtyard. The best thing by far is the indoor swimming pool. We spent a lot of time in there as a family. We have some wonderful memories of our holiday at The Garden House and would highly recommend it as a place to stay with all the family. We rented the Garden House for a week to explore the Wells area and experience living in a house with an indoor pool. Richard and Jane made us very welcome and helped us settle in. The pool is lovely and having it to ourselves most of the time was wonderful. Using the audio video facilities of the pool was initially daunting but with some practice we found it was great to swim whilst listening to our favourite music. We particularly enjoyed evenings in with the log fire burning - real wood fires make all the difference. In summary we were very happy with our stay and would recommend it to others.